The most wonderful thing about the internet is that you never know who will read your blog and contact you. Last October, right before Halloween I wrote a blog about the Stoner House in Westerville, Ohio that was built in the late 1800’s. It not only acted as an Inn and spa, but was also a stop on the Underground Railroad. We talked about the Inn being haunted and I happened to mention that a business by the name of Mystic Nirvana is housed in the upstairs. One day while checking my fan mail there was a message from a nice lady named Brenda that happens to be the owner of Mystic Nirvana. Miss Brenda is a Master Clairvoyant and Psychic Medium. She wrote Doc and me a nice message complimenting our blog and inviting us to come and visit if we would like to know more information about the Stoner House. We didn’t even think twice about the invitation and set up a date to go and visit. As we entered the building and climbed the steps we were warmly greeted by Brenda who showed us into her office. 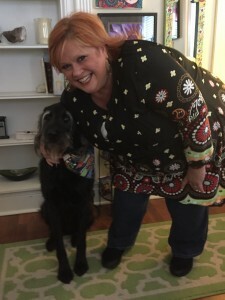 As you know, I am a big dog and as I was sniffing the space, I almost knocked over Brenda’s glass orb right off of its stand. Luckily she removed it before I could do any damage. Doc was slightly horrified as I was not making the greatest first impression. Soon I settled down on a nice rug and listened while she and Doc talked. As you know everyone has a story. I listened as Brenda told Doc about how in her college years she began to have some psychic experiences. Growing up in a home and a church that believed that anything termed psychic was part of the devil, she struggled with coming to terms with what she was experiencing. Over time she worked through her own doubts and fears and followed the path she felt drawn to. Her story made me think about how many times people don’t listen to their inner voice and make life choices based solely on pleasing others. During the visit, Brenda shared some interesting photos taken on the back porch of Stoner House showing brilliant lights coming up from the area where the runaway slaves had been hidden. Brenda feels that the Inn continues to be haunted by spirits that have not crossed over. After they were done talking, Brenda took us on a tour of the entire upstairs. She asked me to be on the look out for any spirits that might be present. I sensed nothing in the first few rooms and when we went into the kitchen I was mostly looking for food that might have dropped on the floor. Then she asked me to come down the hall and go into the bathroom. She said some people had felt some negative energy in there. I went in through the door and stopped right in my tracks. I am not going to tell you what I saw, but Doc knew I was scared because I put my tail between my legs, cowered and backed out that door and headed right for the steps to leave. Even Doc looked a little startled and said she would wait until she got home to use the bathroom. As there were some other people who had arrived to see Brenda, Doc and I thanked her for her time and left. Some of you reading this may not believe in an after life or that people have the ability to connect with the other side. 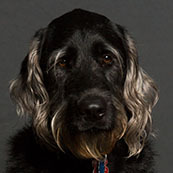 As for this dog, I believe anything is possible. I like to think that when the day comes that Doc and I are no longer together on this earth that we will meet again on the other side and continue our special loving bond. For me, that would be heaven. For all of my regular blog readers you may recall that not only am I a big fan of the show “Finding Bigfoot”, but that I am also a believer. Thanks to Doc being an avid and alert news reader, she saw this article and immediately brought it to my attention. Now I am excitedly passing it on to you as more proof that Bigfoot does exist! Apparently this poor Idaho resident was minding her own business while driving on the highway and crashed into a deer because she was distracted by Sasquatch. 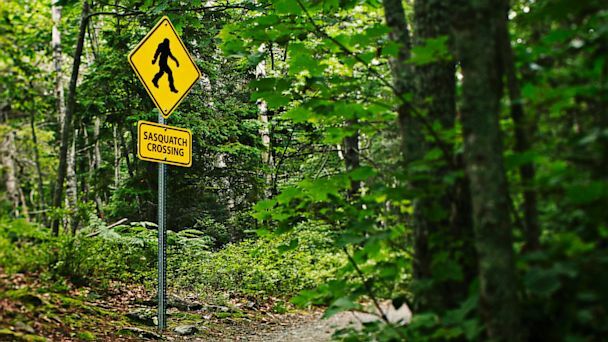 When the sheriff’s arrived on the scene, the 50- year old woman told them that she saw Sasquatch chasing the deer down the side of the road while she was driving. When she looked in her mirror to get a second look at the big fella, whack, she ran right into the deer. Apparently Sasquatch had left the scene of the accident by the time the law arrived and I have to admit that doesn’t say much about the beasts empathy. He should have stayed to help the poor woman since he did cause the accident, but maybe he was afraid of being taken into custody. As the sheriff did not find any signs of Bigfoot, the incident was recorded as a vehicle vs. deer accident. When I read this story, I thought it was more proof that bigfoot lives among us. When I told Doc my theory she burst out laughing as she remains in the non believer camp. It gets my goat when she starts asking me why they have never captured or found one dead. “Where’s the proof?” she asks. I told her that Sasquatch is too smart to leave a trail or be captured. Anyway, sometimes you just have to believe in something even though you’ve never seen it. Personally, I am looking forward for the day when I run into bigfoot and invite him over to our house. I can’t wait to see the look on Doc’s face when she comes home to see the two of us stretched out on the sofa watching “Finding Bigfoot” reruns. I may even invite that woman from Idaho so she hang out with us, take a selfie and sent it to sheriff’s department as proof. Today is April 12 and for all you procrastinators out there, you just have a few days left to file your taxes. It is the time of year when you humans struggle to find receipts that you left in your pockets, the bottom of drawers and in the console of the car, hoping for some more deductions. Some of you reading this may be feeling smug because you either don’t have to fill out an itemized form or you get money back from the government, but hold on to your horses because what you get back is really just a small percentage of what you pay. And don’t forget about those taxes you pay on every purchase you make. Although many tax dollars go toward some important research, you may be interested in knowing about research studies that your taxes also pay for. In 2015 the National Institute of Health awarded The Ohio State University a grant of $387,000 to study the benefits of Swedish massage on 18 white rabbits from New Zealand. They were massaged 4x a day. When I heard about that, I wondered why they didn’t call me up. I don’t live that far away from OSU and would have volunteered to be massaged for a couple of Milk Bones. If that isn’t enough to get you wondering about your tax dollars, the National Science Foundation has given a grant of $171,000 to fund a doctoral student’s research at the University of Rochester, funded through 2018 to study the gambling habits of monkeys. I can just see the student putting the monkeys in car seats, buckling them in and driving to the nearest casino to play Black Jack every day. It kind of reminds me of the picture of the poker playing dogs. So far the doctoral student has been pleased to find out that ” Luckily, monkeys love to gamble.” Who would have suspected that? And last but not least, the National Science Foundation also gave close to a million dollars of taxpayer money to fund a project to find out if they could get mountain lions to walk on a tread mill. The University of California that received the research funding said they had a hard time finding people to participate in the project ( They were surprised by that?) and when they did, it took the mountain lions 8 months to learn to walk on the treadmill. I don’t want to be judgmental, but it seems like those mountain lions must be pretty slow learners. Doc taught me to walk on her treadmill in about 15 minutes. Now that you know where all your hard-earned money is going, doesn’t that make you feel better about paying taxes? I didn’t think so. Just so you know, I would be happy if you could put in a good word for me at one of those institutions dolling out taxpayer money. I am thinking of researching and marketing how to sell my dog poop as garden fertilizer. Oh, I forgot, they are already doing that with Llama poop. 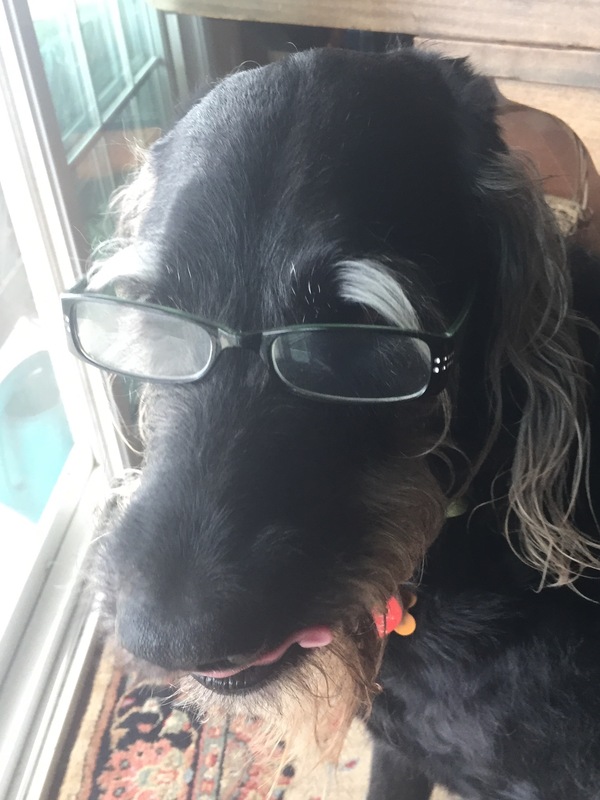 The conversation started something like this, ” I love your blog, but are you aware that you have some dangling participles?” Shocked and embarrassed, I first checked under my tail and between my legs, but by the look on the woman’s face, I knew that was not what she was referring to. I gave her that hound dog look that said ” I have no clue what you are talking about lady.” Picking up on my facial expressions she went on a diatribe about what dangling participles are and gave an example from one of my blogs. 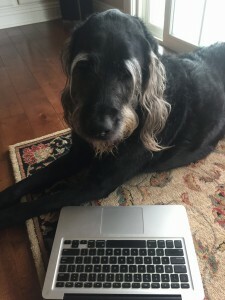 Grover, in one of your blogs you wrote “Writing until the last-minute, the deadline was met.” “Writing until the last-minute” dangles, she said. “Oh”, I thought to myself, now I get it, she’s a charter member of the language police. Now don’t get me wrong, I think language matters, but I don’t speak human, I speak canine. 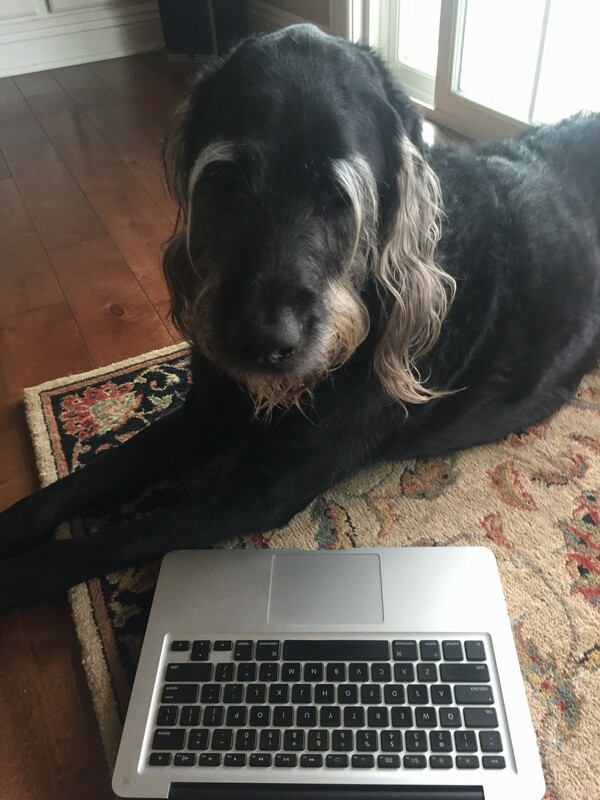 I tried to tell this woman that I have a hard enough time typing the blog with my paws, so I sure don’t have time to worry about the rules of language. Politely I tried to explain that my up bringing on a rural Ohio goat farm and then my exposure to the spoken slangs and twangs from Doc’s Appalachian heritage lends itself to the melody of my written word and should be appreciated in its purest form. She wasn’t impressed, nor did she care. ” One should follow the rules of language if you are going to publish your work”, she said with her steely eyed expression boring into my soul. That was the last straw. Realizing she was stuck in her beliefs and not open to new forms of expression, I decided it was time to set my boundary. I called the lady over to my computer and slowly typed, “Loosing all patience, the dog bit the woman on the leg.” It worked, before I had even typed my last quotation marks, the woman was gone. Free Puppies- Half Cocker Spaniel, half sneaky neighbors dog.